Amid the hottest time of the year, consumer advocates joined with Commonwealth Edison (ComEd) and the Illinois Commerce Commission (ICC) Tuesday to make Chicago-area consumers aware that cooling an empty home, while they are away at work or on vacation, can cause summer energy bills to soar. 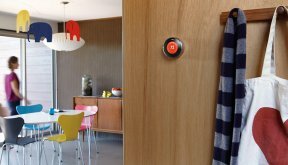 Smart thermostats provide the easy solution to high seasonal bills, and this summer, northern Illinois consumers can take advantage of unprecedented rebates as part of one of the largest thermostat rebate programs in the country. 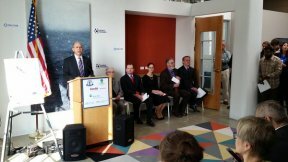 The “One Million Smart Thermostats” initiative, launched in October 2015, is a partnership between the utilities and the advocacy groups Environmental Law & Policy Center (ELPC) and Citizens Utility Board (CUB). Under this initiative smart thermostats are eligible for up to $150 in rebates offered by ComEd and other Illinois gas utilities for customers with WiFi, central air and a furnace. The rebates can help cut the cost of some of these smart devices by more than 50 percent, and give more control to northern Illinois consumers to save money by reducing wasteful energy use. The goal of the program this year is to double the adoption to 100,000 smart thermostats in households across Illinois. To help create awareness and boost adoption, ComEd has launched an educational campaign and a new instant discount option for customers. To make it easier for customers to redeem rebates, ComEd launched a new website, ComEdMarketplace.com, where customers can shop for smart thermostats and other top-rated energy products and take advantage of online instant rebates that reduce purchase costs. In June, ComEd filed with the ICC a new Energy Efficiency Program, under FEJA. The law will double customer savings and reduce electricity use in Illinois by 21 percent by 2030.